Ah, the wisdom of the ages. The institution of motherhood can't possibly have changed since our moms were mothering, right? My mom passed down her book of pregnancy and mothering wisdom when I became a new mom. When I was a new mother, I was fortunate enough to have my own mother living only about a 15-minute drive away. She was kind and caring with her advice, never pushing me to "try this" or admonishing me to "never do that!" At some point when I had a few months' experience under my belt, she shared a book with me that she had when she was newly pregnant — and it still sits on my shelf, next to the Harry Potter series and my stack of InStyle magazines. This Mother's Day, I decided to see just how much the perception of mothers has changed in 50 years. "Guarded by modern medical science, childbirth is no longer a miracle but a safe and satisfying, if somewhat tedious, experience." — Safeguarding Motherhood, fifth edition. 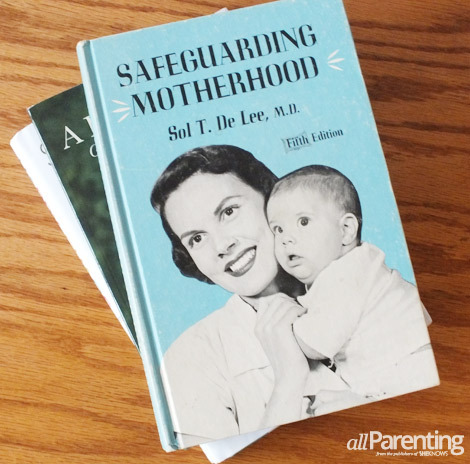 If you found yourself to be "with child" back in the 1960s, you may have turned to Safeguarding Motherhood, by Dr. Sol T. De Lee. Pregnancy was considered somewhat of a medical "condition" and still a bit of a mystery. From physical symptoms of early pregnancy to a mom's mental attitude, this book covered all the bases. THEN: "There is no better tonic than cheerfulness — it is beneficial to health. The prospective mother should take cheerfulness as her motto." Now^Nothing says "cheerful" better than a trip to the spa, a box of glazed donuts and sending the kids to their grandma's house for the weekend. THEN: "The mind should be kept busy — by reading light literature, perhaps, but this must not develop into a whole-day occupation, for exercise is also needed." Now^The pregnant woman's mind is indeed kept busy. Between the toddler screaming for a sippy cup and the dog shredding the bath mat, she can't get a thought in edgewise. Plus she has Angry Birds, Instagram, Facebook and the whole humongous internet. Which of course must not develop into a whole-day occupation. THEN: "Another recreation that might be mentioned here is card-playing. There is no harm in it. Indeed, it is a wholesome way of relaxing, if not abused — but it is fatiguing if indulged in too frequently or for too lengthy sessions." Now^Out of my way, kids, it's Bunco night! How should the father-to-be interact with the pregnant woman? THEN: "He should relieve her as much as possible of worries and make her as happy as he can. She may not be her usual self at times, but he must overlook this." Now^When the father-to-be comes home and finds his pregnant partner in tears, the toddler running around naked and the cat urinating on the drapes, he must overlook this. And leave immediately to buy a few quarts of Ben & Jerry's. THEN: "He should take special care to avoid any remark or gesture which may increase his wife's irritability or bring about a collapse in her weakened condition." Now^Any father-to-be who casually mentions how "hot" Heidi Klum is, even after giving birth to four kids, had better expect to see higher levels of irritability — and plan to spend some quality time sleeping on the couch. THEN: "Some tension between mother and child is natural. It should not be suppressed but should find adequate expression." Now^If by "adequate expression" they meant lecturing your child until you are blue in the face and can't think of another "and another thing!" to add, then this wisdom has passed down through the ages. At least in my house. What pregnancy and mothering advice will you pass down?